Have you ever been in the middle of a sneak attack with your WoW guild and thought, “My actions are in clear violation of several federal and international laws?” Probably not, but the fact remains. There’s an argument to be made that art and interactivity inform your real-life choices, and if that’s the case, you’re probably hosed. Put down the joystick and pump up the volume – if you ever wanted to call yourself a criminal, now’s your chance. Here are nine heinous crimes that you’re committing. Whether it’s old school Duck Hunt or Modern Warfare, you’ve definitely killed someone in a video game. Even if you stick to mostly puzzle games, there’s an element of violence at almost every gaming turn. And, as you’ve been taught, killing is bad. But when you’ve got a joystick gun in your hand, you’re more than happy to do it. Many people have blamed video games for their own criminal tendencies, so here’s hoping that it stops with your screen. The more organized, the better the crime. Or the game, at least. In the multi-console game The Godfather, your ability to advance gameplay involves treacherous murders and street assassinations. 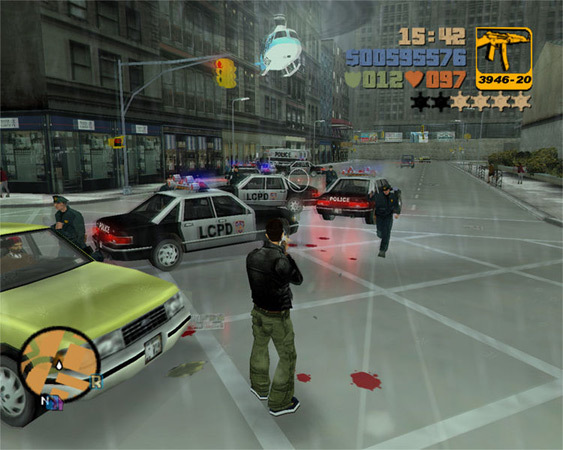 Additionally, missions in the game involve extorting businesses on the mean streets of New York City, and turning neighborhoods into rackets. Even as far back as Space Invaders, exterminating entire (alien) races of people (and aliens) is standard fare for the video game world. And while there are few games that encourage human genocide (2008’s amateur Muslim Massacre is an awful example), it’s the principle of the thing that counts. As gaming begins to be taken more seriously as an art form that’s not going anywhere, academic papers have been popping up recently regarding this same issue. Contrary to what you may glean from eating psychedelic mushrooms in Mario Bros., getting high in Narc, and the many available potions in RPGs (think: Zelda), doing drugs and drinking doesn’t make you bigger and it doesn’t give you extra life or health points. Drugs are bad. Don’t do them. Is eating coins a federal offense? Because that Mario really has it coming. on your willingness to thieve for success. Breaking into buildings, stealing from your enemies, and cashing in your bounty for health potions and experience points may seem a harmless part of the gaming process. But applied in real life that’s theft, burglary, and pick-pocketing. And most of those guns you’re stealing are illegal. government, and civilian buildings abound. Bombings and acts that any real world person would call senseless terrorism are all too common in the make-believe world of many a game. Some games award points for not only driving fast, but also recklessly. In Need for Speed 4, you’re prompted to run from the cops. And even in cuter games, like Mario Kart, popping wheelies and littering banana peels (also a crime!) is simply a fun part of game play. If you’re having trouble with road rage, forgo these games for some soothing Tetris – there are arguments that your in-game actions may affect you in the real world.